Colorful. Dell is upgrading its Inspiron range. Besides the latest processor from the Sandy Bridge family, the notebook's look can be modified to suit personal preferences with help from a switch concept. 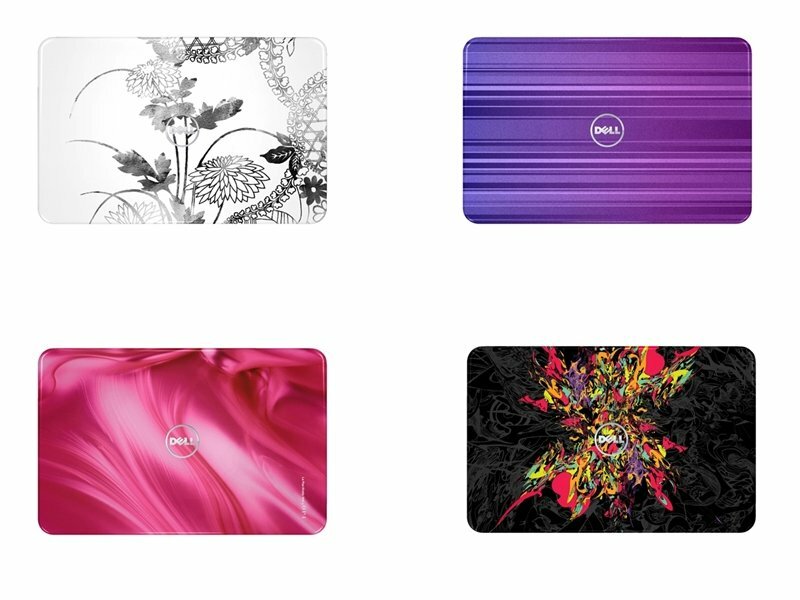 Dell again provides a vast amount of different color combination and designs. After we have recently had the latest versions of the Dell Latitude and Vostro notebooks in review, it's now the upgraded Dell Inspiron 15R's turn. Alike its siblings from the other ranges, the new Sandy Bridge processors have found their way into the Inspiron series. However, the Inspiron series is restricted to the smaller processors, such as the i3-2310M and i5-2410M. The strong i7 processors are reserved for the other devices. The inclined buyer can choose between the Intel HD Graphics 3000 and the AMD Radeon HD 6470M. The standard configuration in the Dell Shop covers a price range of 479.00 euros up to 629.00 euros. But you can modify it even more to suit your personal needs in the Dell configurator. 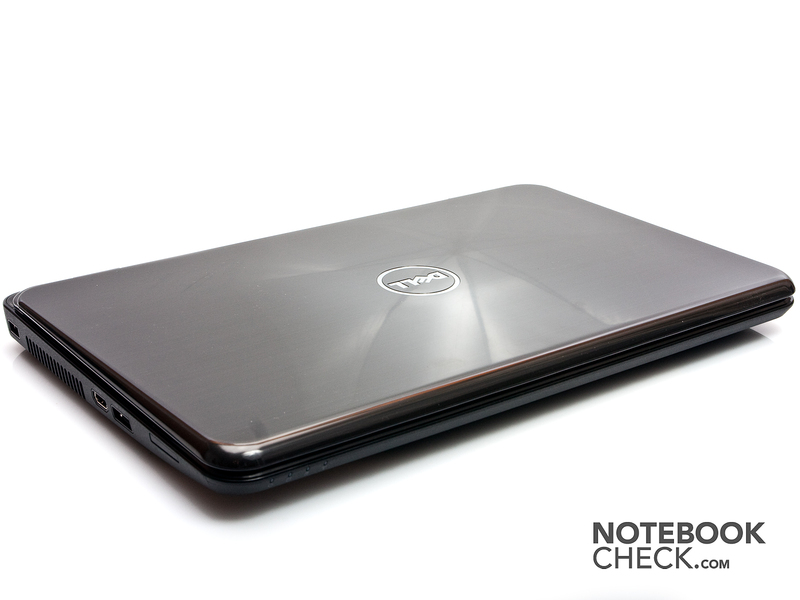 Since our last review of the Dell Inspiron, the 15R hasn't changed much on the outside, when the laptop is closed. The Inspiron 15R still has the display mounted toward the front and thus the base unit slightly protrudes in the back. Dell has however added to the available colors for the notebook in the meantime. As it was only four different designs in our last test, it is now 12 different variations. Starting with basic monochrome up to extremely jazzy – there should be something for everyone's taste. If you don't want to commit yourself to one look, or would like to modify the laptop to match your outfit, you'll be happy to hear that you don't have to limit yourself to one look. In the back part of the display lid, there is a small button which releases the current top shell and allows you to change it. The exchange is as easy as pie and doesn't even take a minute. The more basic design alternatives cost 29.99 euro and the somewhat more intricate ones cost 39.98 euros. When you open the notebook, you'll see that something has changed after all. The wrist-rest and other surfaces are now no longer comprised of light-colored plastic, but now have a dark color. A few new controls have been added in the upper right edge and the touchpad has also been revised. The same horizontal stripes have now been incorporated into the wrist-rest's design, as were used on the display lid. There's basically nothing to complain about in terms of workmanship. The manufacturing's gaps and quality look very good. However, the case isn't quite as resistant to pressure as you might have liked. The wrist-rest can still score very well in our selective pressure tests. However, the keyboard and the rear surfaces yield evidently even under light pressure. The display doesn't excel with an overly great torsional stiffness, either. On the other hand, the hinges are noticed positively. They are pulled quite tight and keep the display securely in place. But it also prevents the Dell Inspiron 15R from being opened with one hand. The hardware refresh bestows the notebook with two of the new USB 3.0 ports, among other interfaces. The Inspiron 15R additionally has a combined USB 2.0/eSATA port. Thus, any external hard disk can be connected to the laptop via a fast interface. Although eSATA doesn't reach the speeds of USB 3.0, you will likely be pleased about this port if you have an external eSATA hard disk. 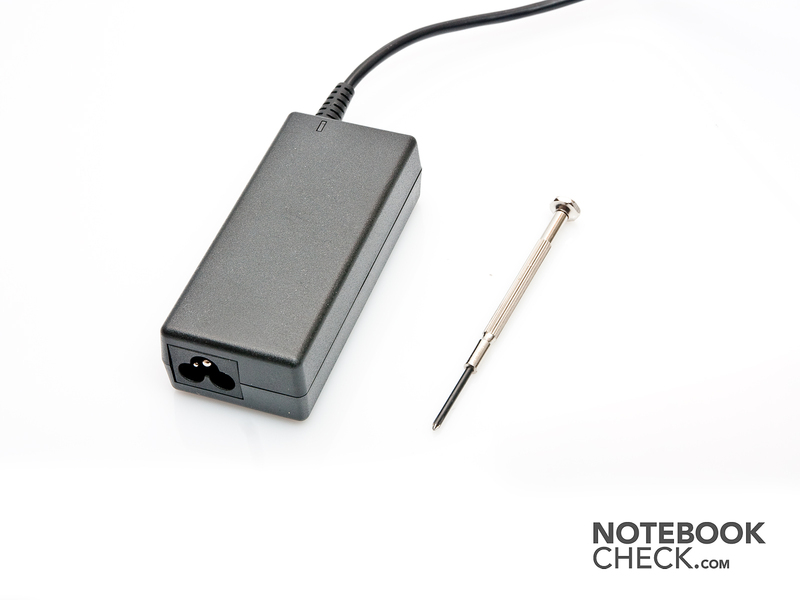 The Inspiron 15R's other connection more or less comply with the current standard. There is a USB 2.0 port, the HDMI socket, the combined USB 2.0/eSATA port and the 8in1 cardreader on the laptop's left. The cardreader supports the card formats SD, SDXC, SDHC, MMC, MMC+, MS, MS PRO and xD. The optical drive, both audio sockets for headphone and microphone and a USB 3.0 port are found on the right. The front doesn't have any interfaces whatever. Merely the status LEDs are located here. The other ports are found on the case's rear. 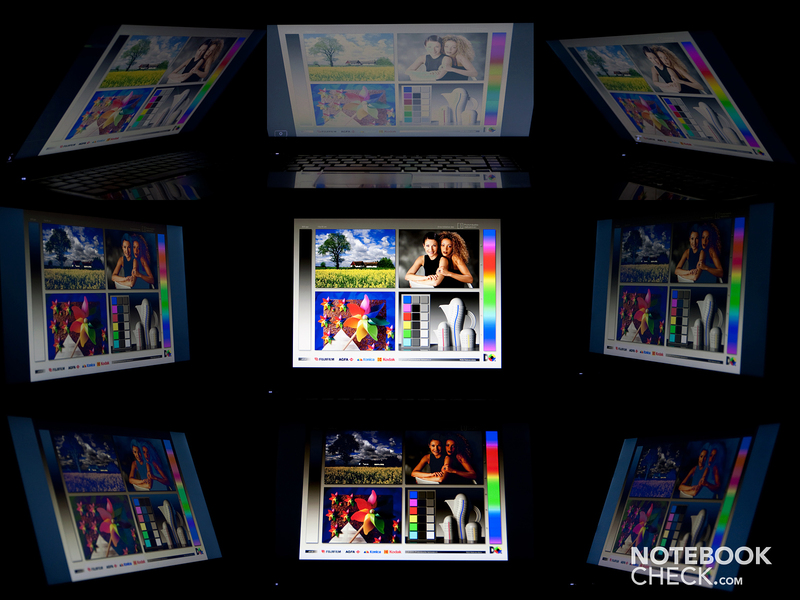 This could be accomplished with a shorter battery that doesn't exploit the notebook's entire length. The Kensington lock, the RJ45 (LAN) socket, another USB 3.0 port, the VGA out and the power adapter's socket is placed on the rear. All in all, Dell has positioned the interfaces favorably. The majority have been placed rather more on the lateral rear areas. This diminishes the cable mess on the desk. Moving a few ports to the rear also contributes to this. As to the single ports, there's no danger of, for example, large USB sticks covering another port since they are all far enough apart. 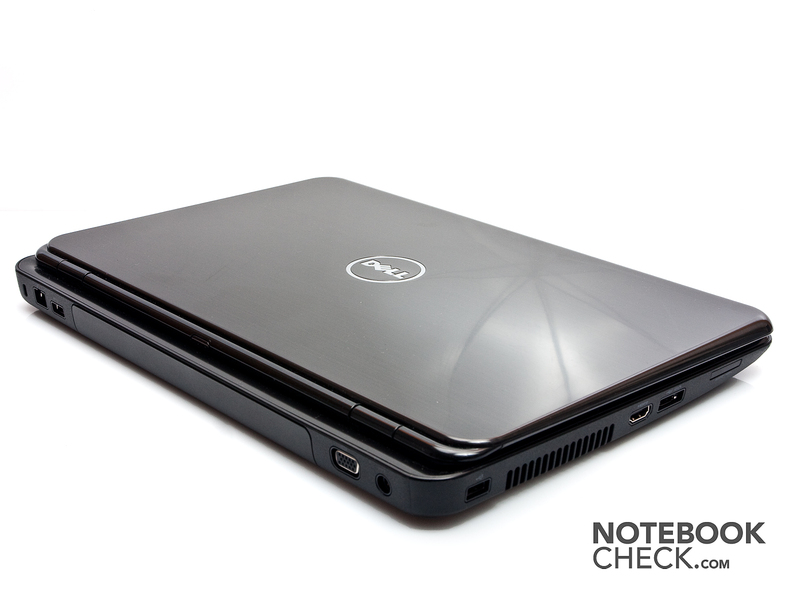 The Dell Inspiron 15R can fall back on LAN, WLAN and Bluetooth as communication options. For LAN, the laptop uses a Realtek PCIe FE Family Controller which allows speeds of 10Mbit, respectively 100MBit. The Inspiron 15R isn't quite up to date in this case. 1000MBit should be warranted in any event. The Intel Centrino Wireless N 1030 takes you wirelessly into the Net. It has the latest standard thanks to 802.11 b/g/n. The installed Bluetooth card, version 3.0 +HS, takes care of communication with peripheral devices. You'll find the usual printed installation instructions and a driver DVD besides the notebook, the battery and the power adapter in the scope of delivery. There's no recovery DVD for Windows 7, but it can be optionally acquired in the Dell configurator. Dell demands a surcharge of 5.00 euros for it. 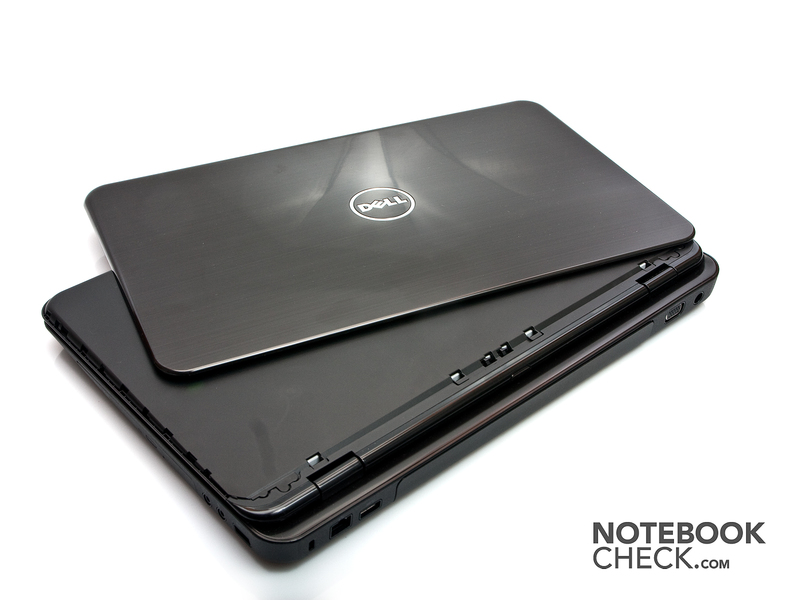 Dell offers a basic warranty of 1 year for the Inspiron 15R. It includes a repair period of 10 days. The laptop has to be sent in for that. Dell has numerous supplementary bundles in its configurator with which the service can be extended. Aside a warranty period extension of up to 4 years, there is also an onsite service and a service for evenings and Saturdays can be activated. Dell charges quite a bit for all this. Thus, the "4 year hardware support" service for the next business day costs an additional 280.00 euros. 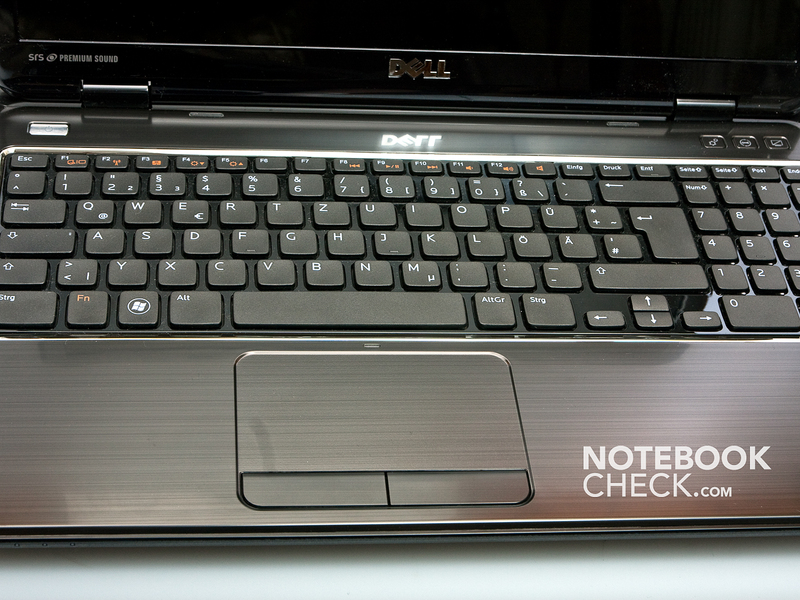 At first glance, the Dell Inspiron 15R's keyboard looks good with its single key layout (chiclet style). Even the separately cut out keys are still big enough to hit accurately with a size of 14x14 millimeters. This is also due to the generous key gap of 4 millimeters. And even a number pad has found its way into the Inspiron 15R. So, all those things that can be well rated as positive. Unfortunately, the keyboard has a few serious drawbacks. As already mentioned in the section "Case", the keyboard isn't very stable and already yields noticeably when you're typing. The typing noise also doesn't at all sound like quality. Judging from the clattery noise, it looks rather more corners have been cut. The keyboard overall makes a very spongy impression, although the typing feel on the keyboard is acceptable. However, it's annoyingly noticed that the keyboard yields with every keystroke while typing. Moreover, we ask ourselves what the glossy crosspieces between the single keys are good for. Only fingerprints remain when a key isn't hit precisely and cleaning the gaps is a quite a hard piece of work. Three quick access keys are located above the keyboard's right. They open the Mobility Center and Dell's Support Center. The third key can be mapped with a program of choice or website link by the user. 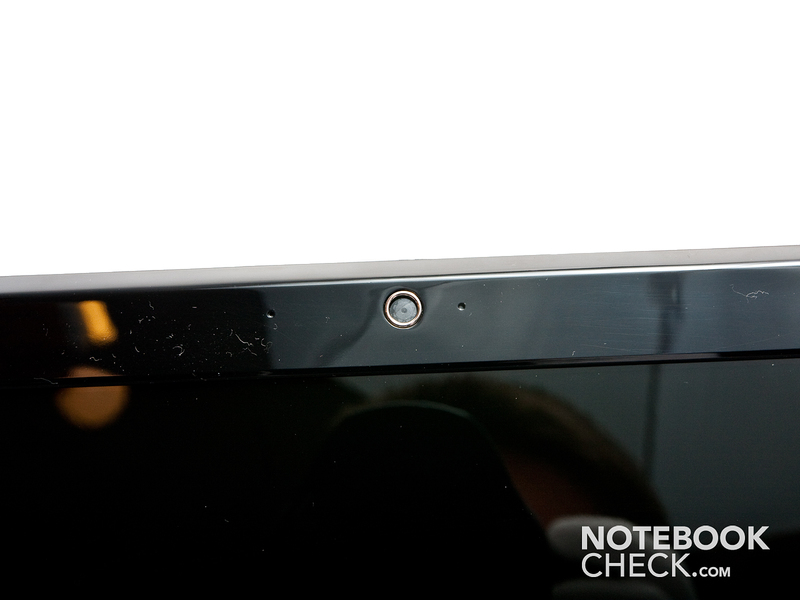 The touchpad completely convinced us with its diagonal of 115 millimeters. It is incorporated into the laptop's wrist-rest. Consequently, there is a noticeable edge which indicates the touchpad boundaries, yet there is no gap that collects dirt particles. Navigating with the touchpad worked very well in the test and the mouse cursor responded very precisely to inputs via touchpad. Multi-touch is also a part of the touchpad's functionality, and there's no reason for complaint here, either. Both mouse keys below the touchpad have a slightly spongy feel in our opinion. The pressure point could be a bit crisper and the key drop also seems very long. Basically, you first have to get used to the keys. In addition, the keys don't emit an audible click and you don't receive an acoustic feedback. To what extent this will be considered to be annoying is a personal matter. Dell uses a 15.6 inch sized display with LED backlight in the Inspiron 15R. The display has a resolution of 1366x768 pixels and includes a glossy surface. Regrettably, there aren't any other options in Dell's configurator and thus, the entire Inspiron 15R range is limited to this display. The display is very suitable for rendering movies due to the 16:9 format. The display can't exactly score with its luminosity. A maximum brightness rate of 194 cd/m2 isn't particularly high and is annihilated by comparable notebooks of this field. However, the display excels with a very even illumination. The display is nearly perfectly homogeneously illuminated with 96 percent. However, the maximum brightness is reduced in battery mode. We only still measure 174 cd/m2 in the center measuring field. Thus, the brightness sinks by 9% in battery mode. The black value is just below the 1.0 cd/m2 limit with 0.98 cd/m2 and thus is already within a good range. Nevertheless, this together with the low brightness results in a not very convincing contrast of 195:1. The Dell Inspiron 15R's display is very far from covering the AdobeRGB color spectrum and it's also gets tight with the sRGB color space. The Inspiron 15R can keep up when compared with other current budget laptops in the multimedia field, though. But it doesn't stand a chance against our reference display, as was to be expected. 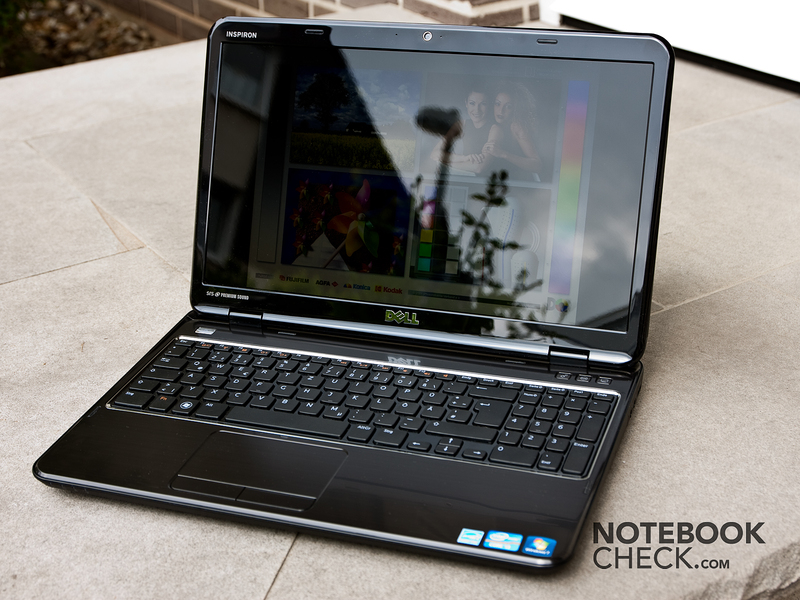 The Dell Inspiron 15R is only useable to an extent outside in the fresh air. You should look for a shady place to be able to work reasonably on the laptop. Not only the reflective display, but the low contrast and the not very bright display also decisively contribute to illegibility in the sun. The glossy display bezel is also sooner deterrent outdoors. The Inspiron 15R's display does quite well in terms of viewing angles. Dimming and color deviations turn up quite late horizontally. Therefore, even several people can look at the screen at the same time without difficulty. However, the picture quickly loses its contrast until ultimately nothing can be seen on the screen vertically. The Intel Core i3-2310M processor is a midrange notebook processor from the latest Sandy Bridge range. The dual core processor clocks with 2.1 GHz, has a 3MB L3 cache and is able to process up to 4 threads at the same time due to Hyper Threading. 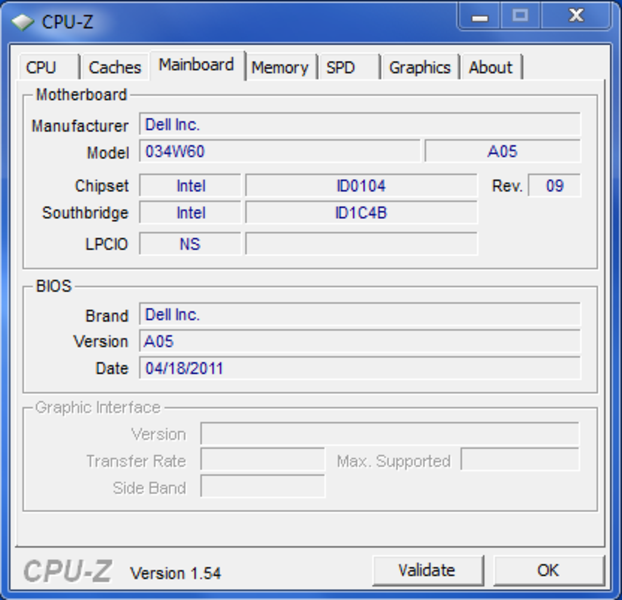 The processor additionally has an incorporated graphics card. The Intel HD Graphics 3000 is on about the same level as the entry level graphics, Nvidia GeForce 310M. In contrast to its bigger siblings, the i5 and i7 processors, the i3 processors don't have the Turbo Boost function. Therefore, the processor isn't overclocked at performance peaks. The incorporated graphics card can though, and it is clocked with 650MHz up to 1100 MHz when required. Thanks to the new architecture, the latest processors have received a performance plus in comparison to their predecessors. 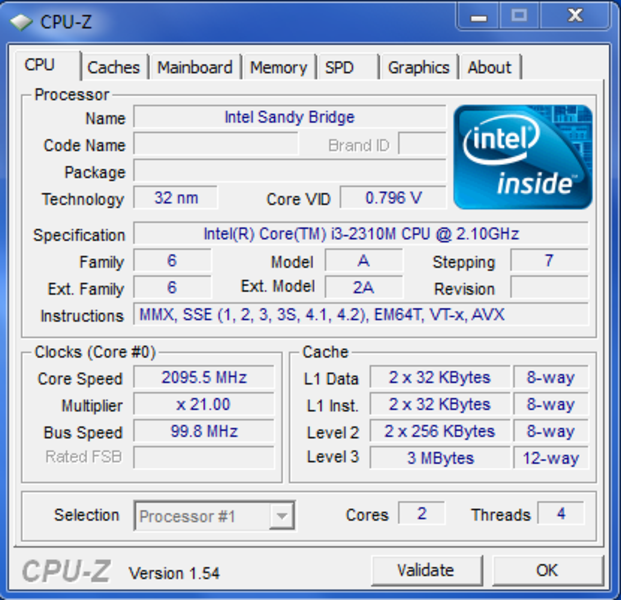 Thus the Intel Core i3-2310M is comparable with the somewhat older Core i5-430M (2.3 – 2.5 GHz). With a TDP of 35 watts, the Core i3 processor is most suitable for laptops with a size of 14" or more. The Core i3-2310M will be very sufficient for most applications that everyday has to offer. Incorporated graphic cards are a low performance graphics card that has been designed for basic tasks. The graphics card biggest advantage is its low power consumption. But the fact that it is directly built into the processor also has advantages. For example, the graphics card doesn't need an extra cooling because the processor's cooling takes care of it right away. As to the application fields covered by the graphics card, office tasks or surfing on the Net are clearly in the foreground. The graphics card can also cope with a few newer games, but they can only be played on a low detail level. This may be acceptable for casual gamers, but everyone who spends a bit more time with gaming will be discouraged by this graphics card. These clients ultimately will take the alternatively available AMD HD 6470M GPU, which however can't really go beyond low to medium graphics settings in the latest games. The Inspiron 15R notebook achieves 3458.0 points in Cinebench R10 Single Rendering Test (64bit). Thus, it's immediately behind the Dell Vostro 3750 (2310M, HD Graphics 3000) with 3464.0 points. Both notebooks have the same processor-graphics card combination. And both laptops come from the same manufacturer so that we will likely find the Vostro 3750 in the immediate vicinity of the Inspiron 15R in our benchmark comparisons. The Lenovo ThinkPad L520 NWB53GE (2310M, HD Graphics 3000) also has the same processor and graphics card, but scores marginally worse than the Dell notebooks with 3410.0 points. The Inspiron 15R and Vostro 3750 trade places in Cinebench R10 Multi Rendering (64bit). 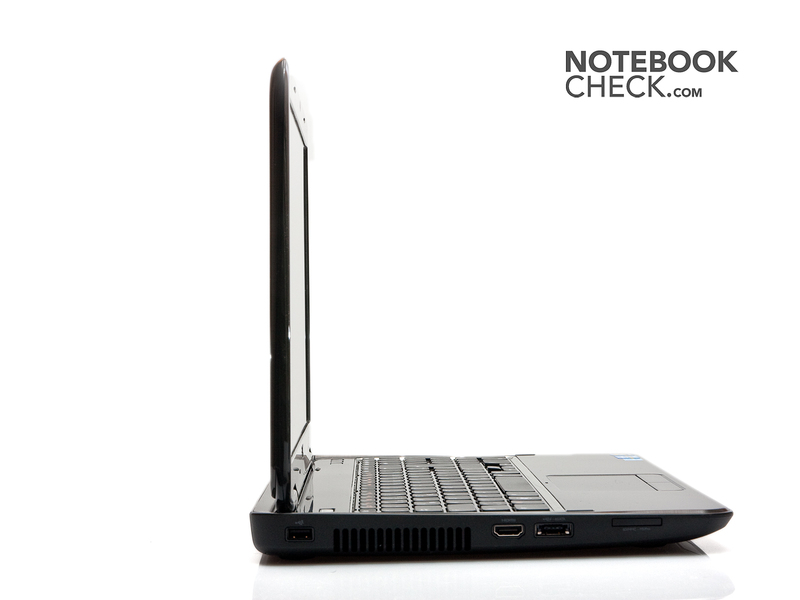 The Dell Inspiron 15R achieves 7531.0 points, while the Vostro 3750 reaches 7495.0 points. The somewhat larger Dell Inspiron 17R (430M, Mobility Radeon HD 5470) has a slightly better score than the Inspiron 15R with 7554.0 points. The Inspiron 15R manages 4016.0 points in Cinebench R10 Shading (64bit), while the Vostro 3750 again has a slight lead on the Inspiron 15R with 4123.0 points. 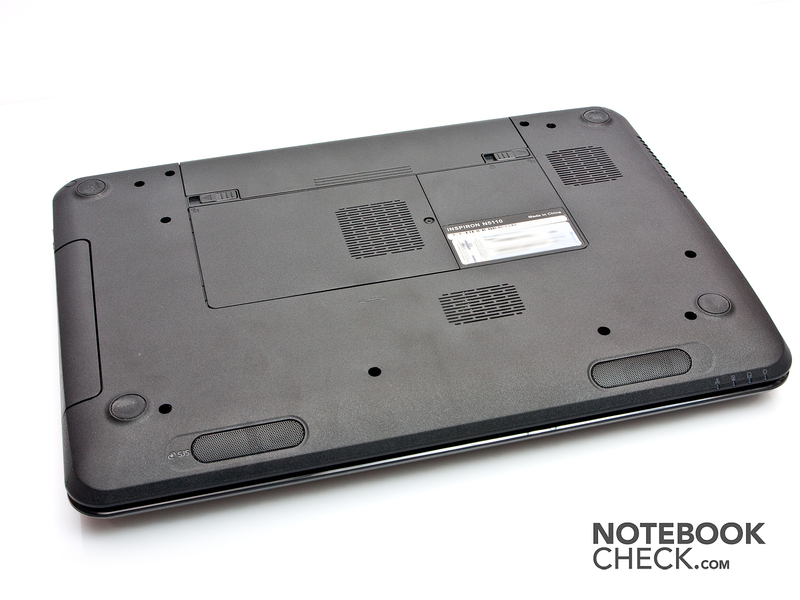 Then again, the Inspiron 17R places itself slightly before the 15R with 4298.0 points. 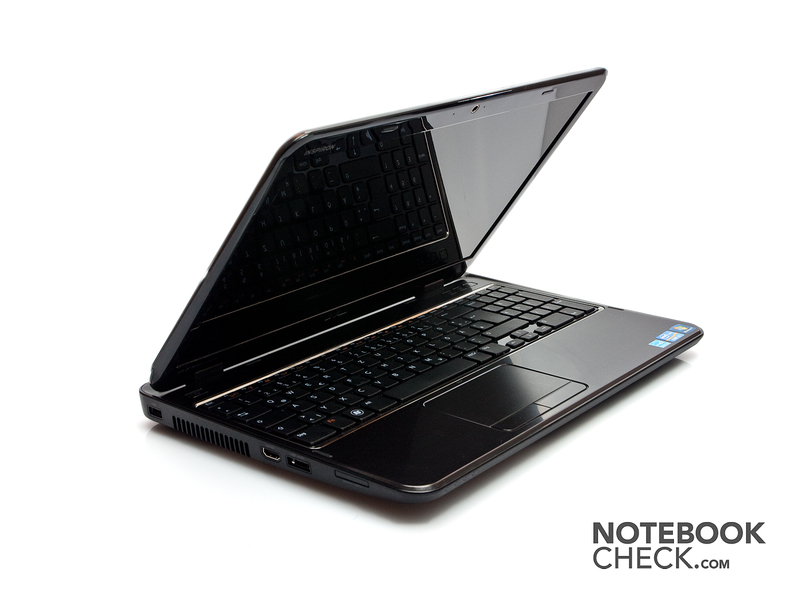 You should consider that the Inspiron 17R (430M, Mobility Radeon HD 5470) is from the previous generation. 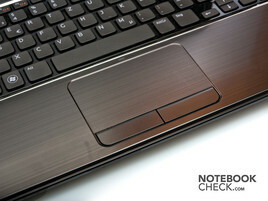 The Inspiron 15R notebook can't really excel in the PCMark Vantage benchmark. It achieves a score of 4617.0 here. 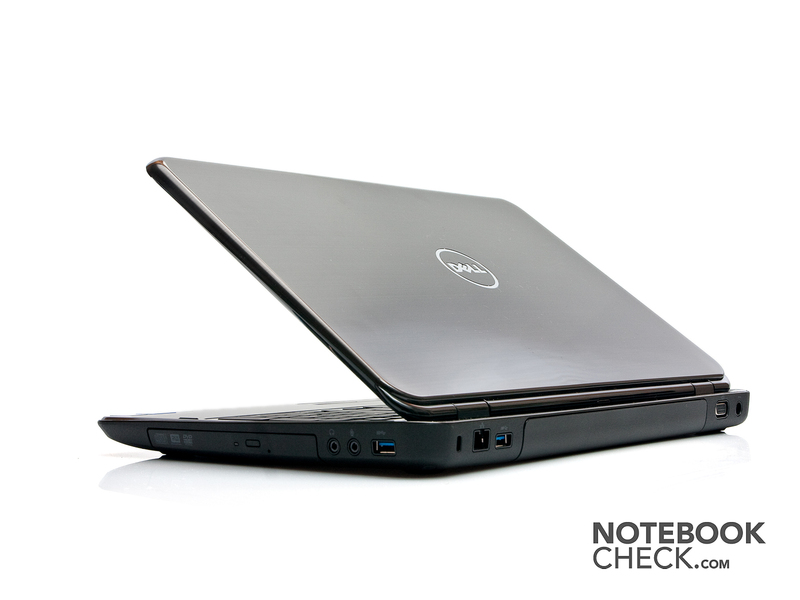 The Dell Vostro 3750 (2310M, HD Graphics 3000) scores a lot better with 5761.0 points. The Vostro can especially gain ground with its faster hard disk in this case. It rotates with 7200 rpm in opposition to the 15R's with 5400 rpm. The Sony Vaio VPC-EC1M1E (330M, Mobility Radeon HD5470) is comparable to the Inspiron 15R's rating. 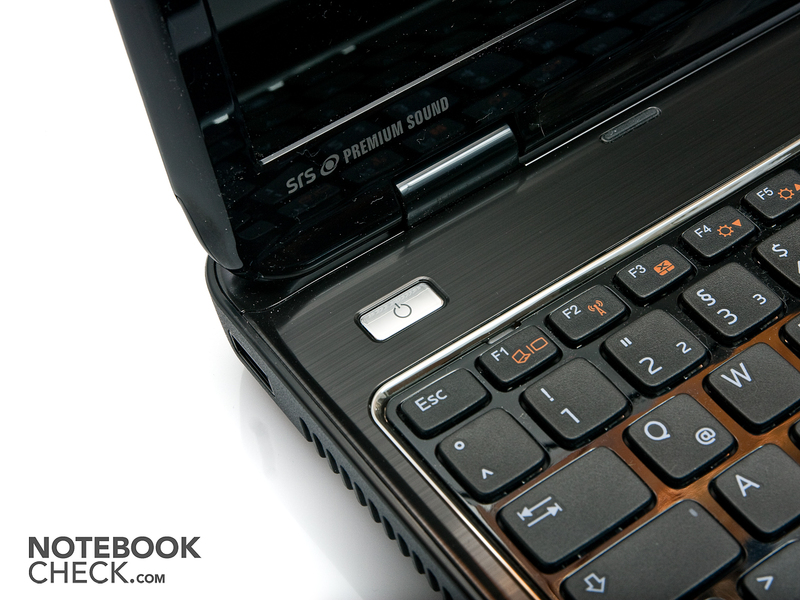 The Sony laptop achieves a score of 4610.0 points. 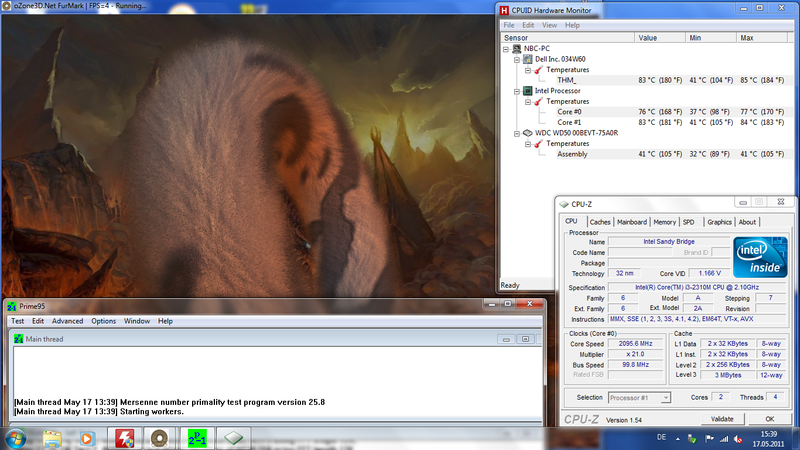 The Dell Inspiron 15R can't really stand out in the 3DMark06 benchmark either. But that's no surprise because the Intel graphics card isn't intended for breaking records. With 3341.0 points the Dell Inspiron 15R is in front of the Dell Latitude E5420 Essential (2310M, HD Graphics 3000) with 3330.0 points. 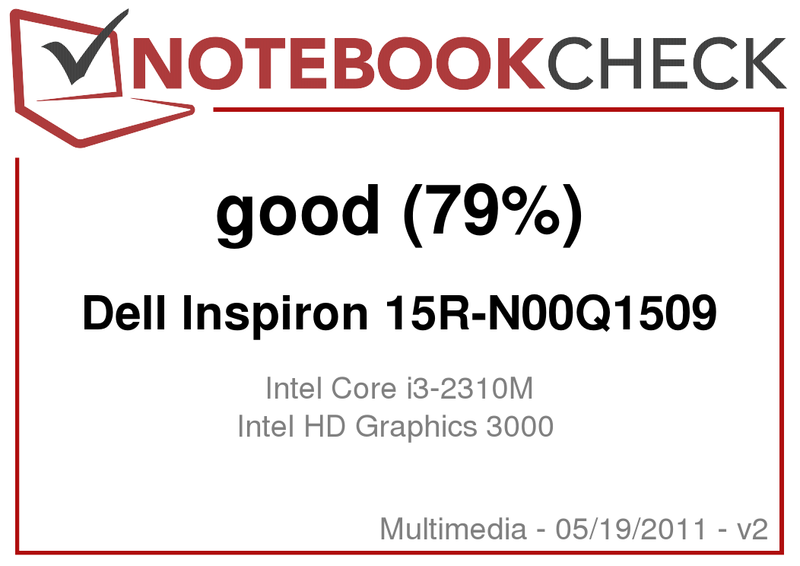 However, the Inspiron 15R is in the lower quarter of our benchmark chart of all reviewed notebooks. A Western Digital WD5000BEVT-75A0RT0 hard disk with a (gross) capacity of 500 GB is installed. It is a 2.5 inch model with a speed of 5400 rpm. The hard disk doesn't exactly belong to the fastest models with an average transfer rate of 62.3 MB/s. The access rate of 18.8 milliseconds also makes this clear. The hard disk is in the midfield of the latest 2.5 inch hard disks. Since the Dell Inspiron 15R isn't really a gaming laptop and games are rather secondary with the Intel HD Graphics 3000, we will limit ourselves to a go with StarCraft 2 here. How other games run on this graphics card can be read in our comprehensive database "Computer Games on Laptop Graphics Cards". StarCraft 2: Wings of Liberty runs smoothly and without problems in a low resolution and the lowest details with 51 frames per second. However, as soon as you only increase the resolution or set the details to medium, the Intel HD graphics card has a hard time and the frame rate nosedives to 12 frames per second. The game is no longer playable with that. We didn't execute the test in the Full HD resolution and maximum details in view of these rates. However, the accomplished result roughly correlates to that what we had expected due to our database entries. On average, the Dell Inspiron is a bit slower than the values in the database, but the rates are suitable for showing tendencies in any case. The Inspiron 15R is fairly quiet in idle mode. It always stays in the background with 31 dB(A) and can also be used in quieter surroundings without hesitation. 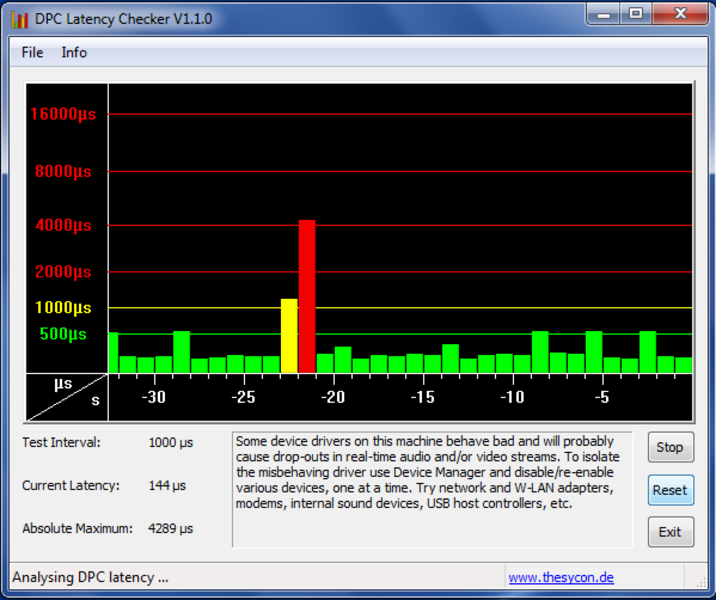 The noise level also only increases marginally when the laptop is put under moderate load. The notebook develops a noise level of 32.8 dB(A). When the Inspiron 15R is put under full load and the cooling system is really in demand (stress test), the notebook develops a noise of 42.3 dB(A). The laptop also does an acceptable job here. However, it's a bit too bad that the drive is clearly audible while rendering a DVD. As expected, when the Inspiron 15R is in idle or used for light office tasks, it stays cool. The temperatures on the top reach a maximum of 26.6 degrees Celsius. The touchpad hardly heats up noticeably with 25 degrees Celsius. The Inspiron 15R's bottom is a bit warmer with 28.1 degrees Celsius, but still remote from disagreeable temperatures. The Inspiron 15R's temperatures increase slightly during load. Now we measure 26.7 degrees Celsius (left) and 24.1 degrees Celsius (right) on both wrist-rests. The touchpad's temperature stays nearly constant with 24.7 degrees Celsius. The bottom heats up a bit more. Rates of just below 40 degrees Celsius are reached on the bottom in the vent's vicinity. Overall, the bottom remains very cool, though. Thus, it's no problem to use the laptop in every operating state on the lap for a longer time. 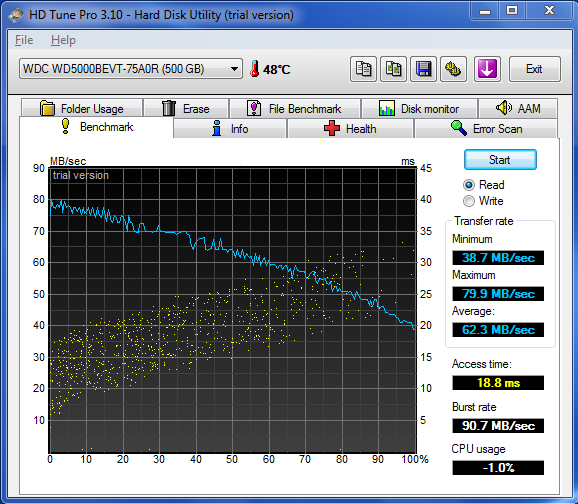 Our full load simulation didn't prove to be a problem for the Dell Inspiron 15R. A performance reduction (throttling) also couldn't be determined, neither during the stress test nor afterwards. (+) The average temperature for the upper side under maximal load is 26 °C / 79 F, compared to the average of 30.9 °C / 88 F for the devices in the class Multimedia. (+) The maximum temperature on the upper side is 28.4 °C / 83 F, compared to the average of 36.5 °C / 98 F, ranging from 21.1 to 71 °C for the class Multimedia. (+) The average temperature of the palmrest area of similar devices was 29.1 °C / 84.4 F (+2.4 °C / 4.3 F). The speakers are basically convincing. The SRS sound system that Dell installs delivers a good sound. Both speakers have been, a bit unusual, placed at the front. But this doesn't affect the sound quality. Only the basses come too short. 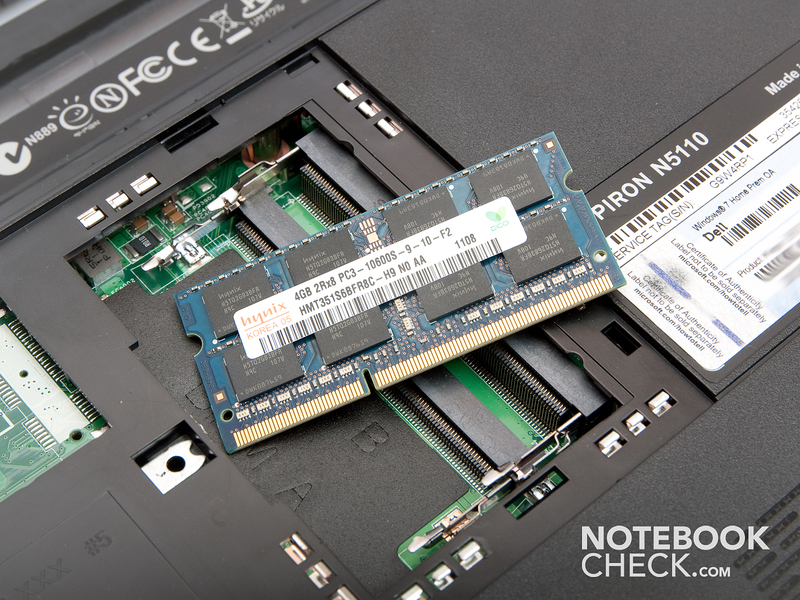 We use the program, BatteryEater Pro, to determine the Inspiron 15R's battery runtimes. 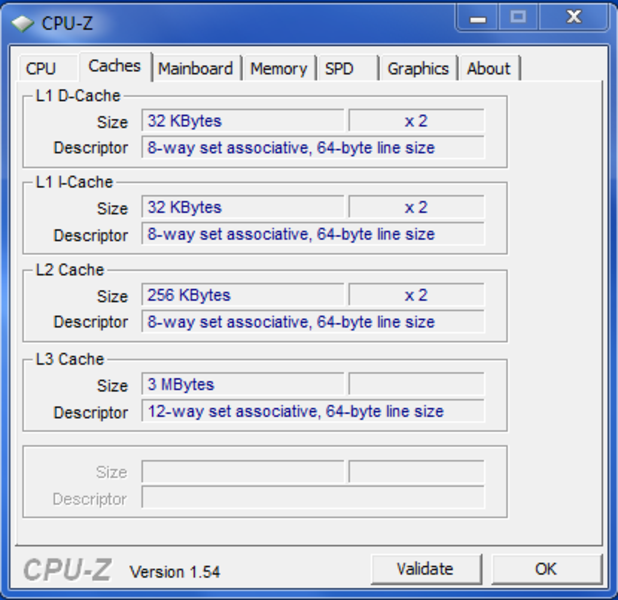 Diverse profiles, which simulate use during load or idle, are used. The Classic Test simulates the use during load. 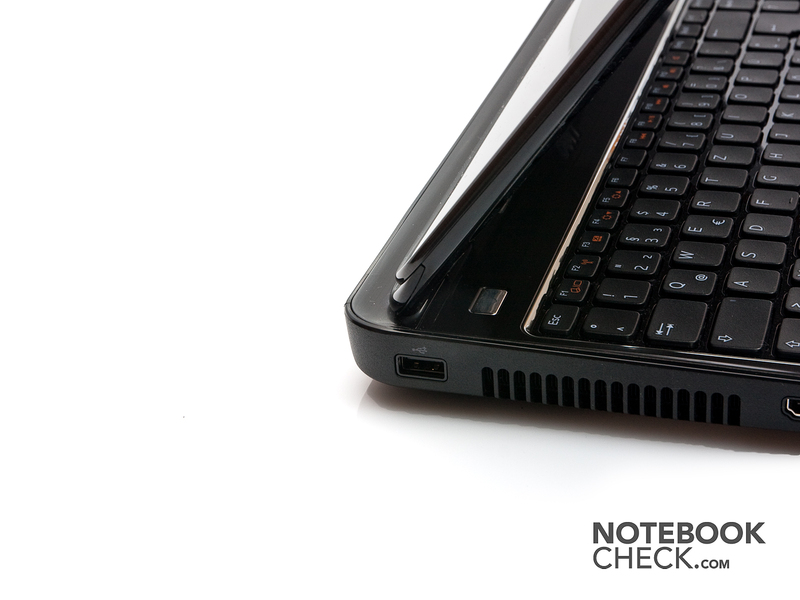 The Inspiron 15R achieves a runtime of 1 hour and 21 minutes in this test. 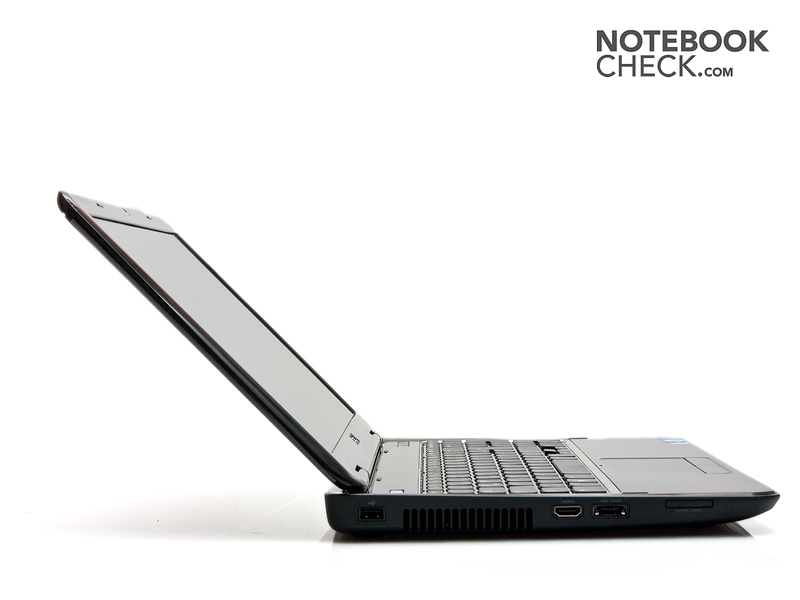 The notebook reaches an impressive battery runtime of 8 hours and 8 minutes in the Reader's Test, which simulates idle mode with maximum energy saving options. If you'd like to watch a DVD on the go, the battery still lasts for 3 hours and 40 minutes. That should be enough for watching practically every movie to its end. The laptop's power consumption in idle, respectively during very light load is between 14.1 watts and 18.0 watts. The rates increase to 41.4 watts during load, respectively a maximum of 63.7 watts in full load. When the laptop is turned off, it only needs 0.1 watts and in standby only 0.4 watts. 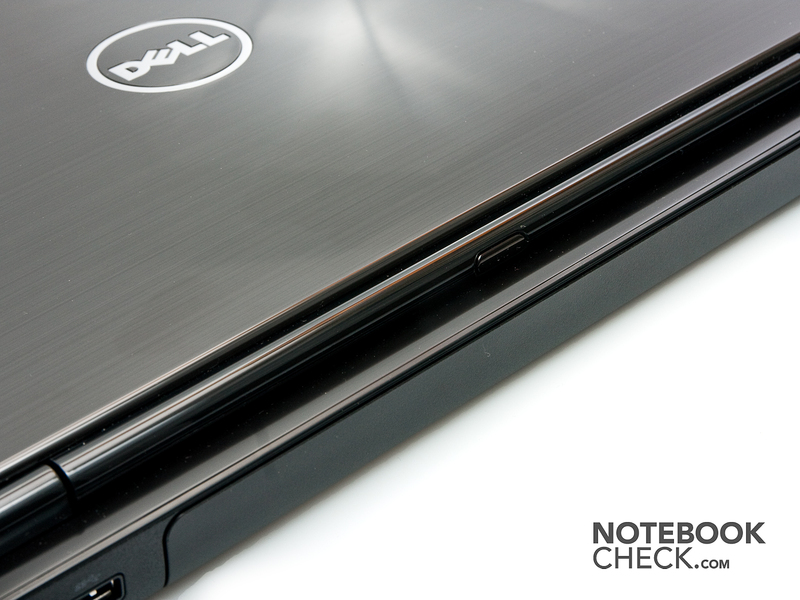 The Dell Inspiron 15R notebook was able to make a positive impression in our test. Dell supplies you with a well manufactured notebook with good office performance for not quite 500 euros. Even individualists can take delight on the Inspiron 15R due to its easily exchangeable display lid. Dell has a few very intricate and optically unusual designs available. The Dell Inspiron 15R also has attractive battery runtimes due to the graphics card incorporated into the processor and their energy saving mechanisms. However, the Inspiron 15R is not only dazzling. For example, the keyboard was rather disappointing in the test, although the requirements for a good keyboard are actually given. But the basically very spongy typing feel and its permanent yielding spoil this. The Inspiron 15R will definitely not be interesting for gamers. The Intel graphics incorporated into the processor just doesn't supply enough performance for the latest games. This also generally applies to the alternatively available HD 6470M graphics solution. Newbies in the notebook market can however definitely consider the Dell Inspiron 15R, if they can live with the keyboard. Dell Inspiron 15R, the quick-change artist. The power adapter is nice and small and light. However, it only allows access to the RAM. There is a cover on the bottom which grants access to the laptop's innards. The webcam installed in the display. Alas, it couldn't convince us. and three hot keys. One can be mapped individually. in a fairly small opening angle. The display's position is a bit exceptional. It's a bit more in the front than usual. exchanging it with one of many designs. Unfortunately, you won't often be outside with the Inspiron 15R anyway. The display is very reflective. The exchangeable display lid. This way everyone can decide how they want to design their notebook. A better keyboard. 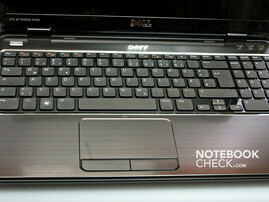 Dell has proved that they can do that a lot better in the Vostro models (that have a very similar keyboard design). The Inspiron 15R is really Dell's top seller? !